This is one of my more unusual pieces and I'm not sure what to call it--handbill, broadside, flyer... A rose by any other name and all that, it's beautiful regardless of labels. 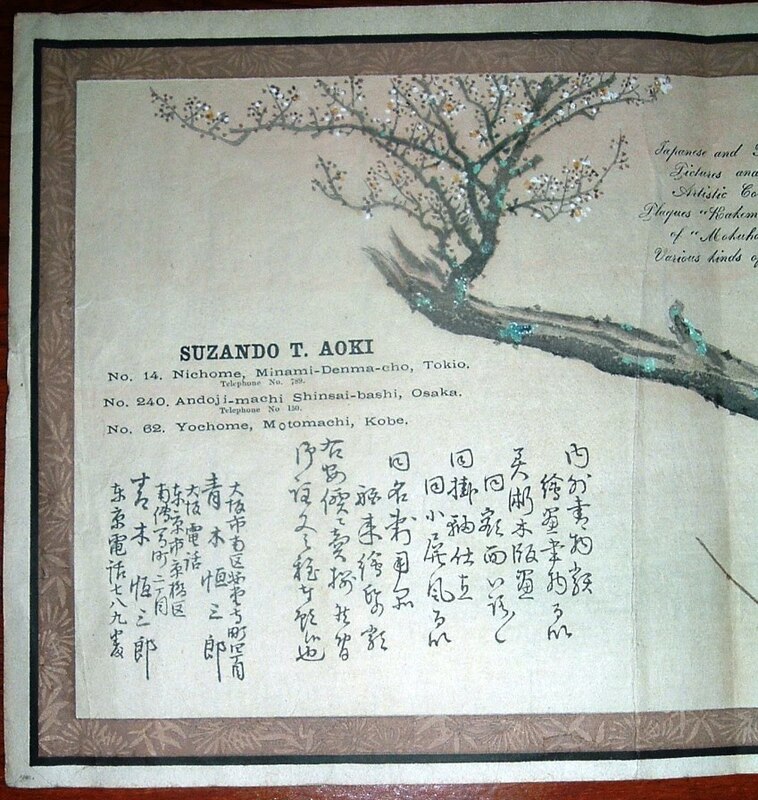 This ad for publisher and bookseller Suzando T. Aoki dates to circa 1900, as I have found a few references to books published by Aoki in the 1900-1905 date range. It measures nearly a foot in length (28 cm). 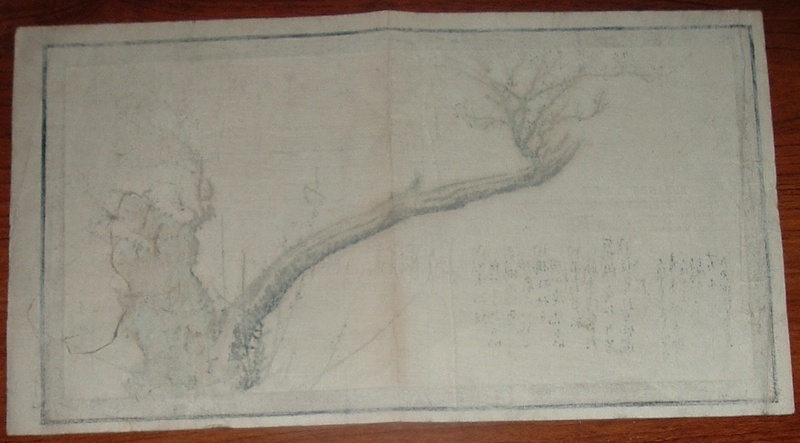 The paper appears to be hand painted, though I can't say for certain. I'm way outside my knowledge base on this one. 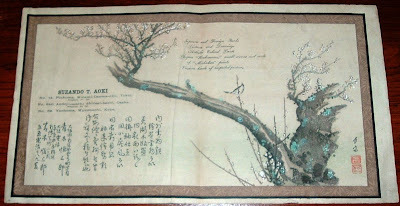 And the paper is something you have to hold and feel to appreciate the fibrous texture and quality. It's almost like a fabric. 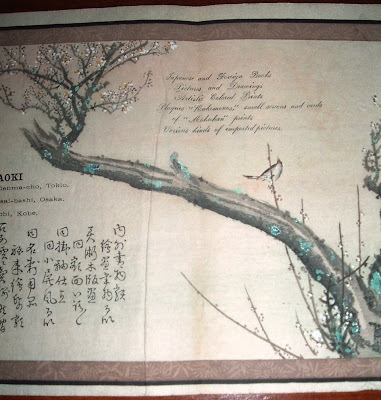 The Japanese Paper Place shares some history on traditional Japanese paper, called Washi, which I'm guessing Aoki selected more than a hundred years ago as the appropriate medium for this advertisement for his books. 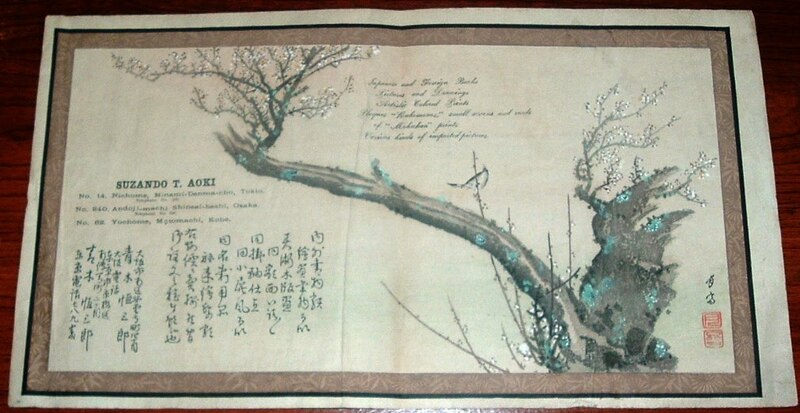 "Japanese paper seems to match the beautiful interiors of the buildings. It is almost a form of architecture." 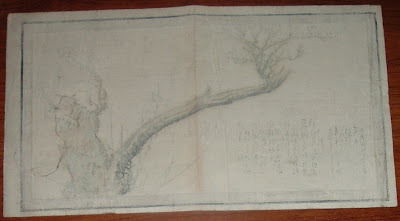 "The Japanese believe that papermaking is from the soul. It's not a job, it's an art." 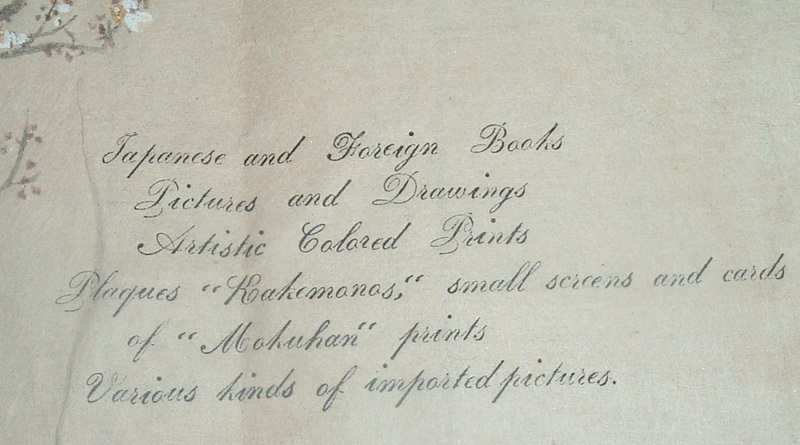 On this handbill's section of English text, Aoki advertises what appears to be a fine selection of books and art. I can't think of a better way for a bookseller to make a statement about his fine books and art than with an advertising piece that is itself a work of art. 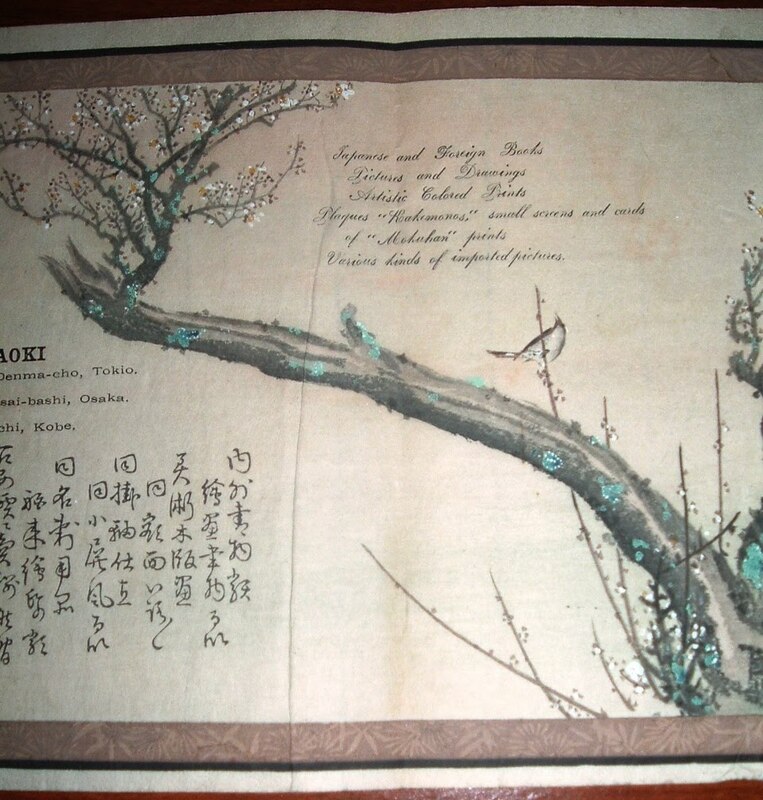 But around the time this piece was crafted, some 100,000 Japanese artisans practiced the papermaking art. As of the 2002 article referenced above, those ranks had diminished to a mere 400 or so. 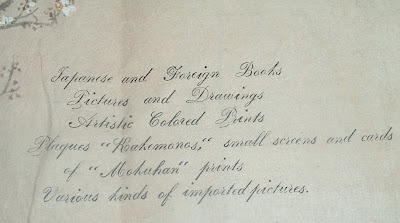 With today's market commanding up to several hundred dollars for a single sheet of paper (per the 2002 article), it's doubtful today's bookseller or publisher would want to put in an order for ephemeral advertising pieces such as Aoki's handbill, which seems like the higher end variety. 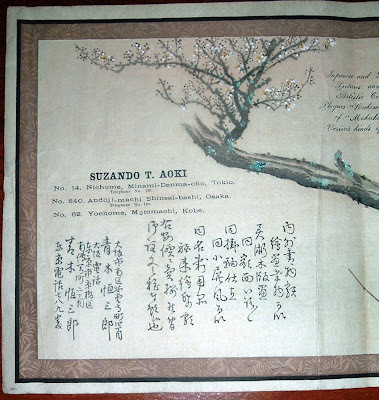 Thankfully, Aoki was able to use handmade paper and this piece survived beyond its intended use. 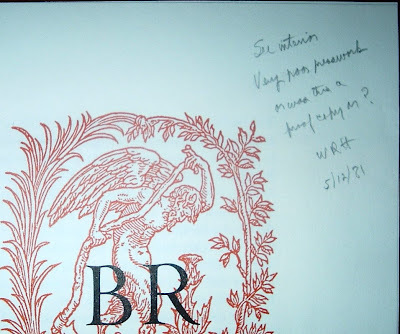 I heard today from Gregg Silvis at the University of Delaware Library, who had seen my post about John Stuart Groves' bookplate and Delawareana. He thought their digital bookplate collection, William Augustus Brewer Bookplate Collection, would be of interest to readers on this blog. It certainly was to me. In addition to the bookplate collection, try the University of Delaware Library Digital Collections link and have fun with that visual feast of history. 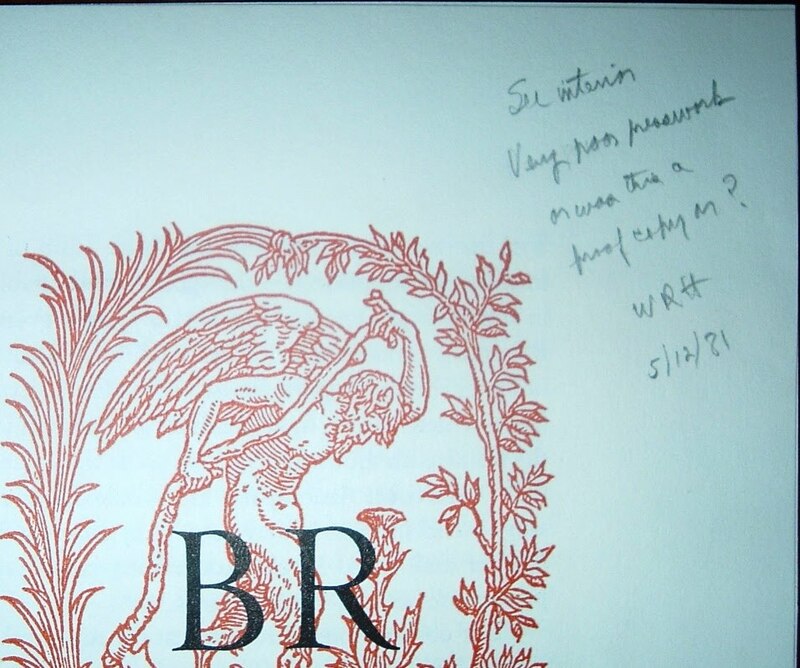 This also ties in neatly with something else I wrote earlier this year, some thoughts on digital ephemera, after receiving a digital copy of a bookplate. 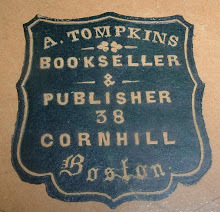 Reverend William Augustus Brewer was an avid bookplate collector. His wife, Augusta LaMotte Brewer, bequeathed his collection to the University of Delaware Library after her husband’s death. The William Augustus Brewer Bookplate Collection comprises 12,680 printed bookplates dating mainly from the eighteenth, nineteenth and twentieth centuries. The collection includes bookplates from the libraries of John Carter Brown, Lewis Carroll, Samuel L. Clemens, Calvin Coolidge, Charles Dickens, Walt Disney, Edward Gibbon, Alexander Hamilton, Harry Houdini, Samuel Pepys, Howard Pyle, Paul Revere, Eleanor Roosevelt, Franklin Delano Roosevelt, Theodore Roosevelt, Alfred Stieglitz and William Butler Yeats, as well as many others. The designers of the bookplates include Thomas Bewick, Edward Burne-Jones, Kate Greenaway, William Hogarth, Howard Pyle, Rudolf Ruzicka, and James A. M. Whistler. Subjects illustrated in the bookplates are varied, inclucing birds, death’s heads, medicine, music, rebuses, and portraits of historical and literary figures. The William Augustus Brewer Digital Bookplate Collection currently contains 3,040 of these bookplates, with the remaining 10,000 to be added in 2011. 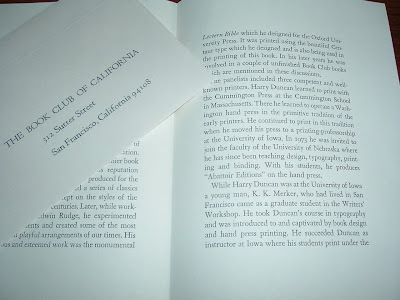 Back in June, I wrote about a 1957 Book Club of California prospectus for a forthcoming book that year about Mark Twain. This prospectus was one item in a batch of ephemera that Bill Holman gave to me for my ephemera collection. 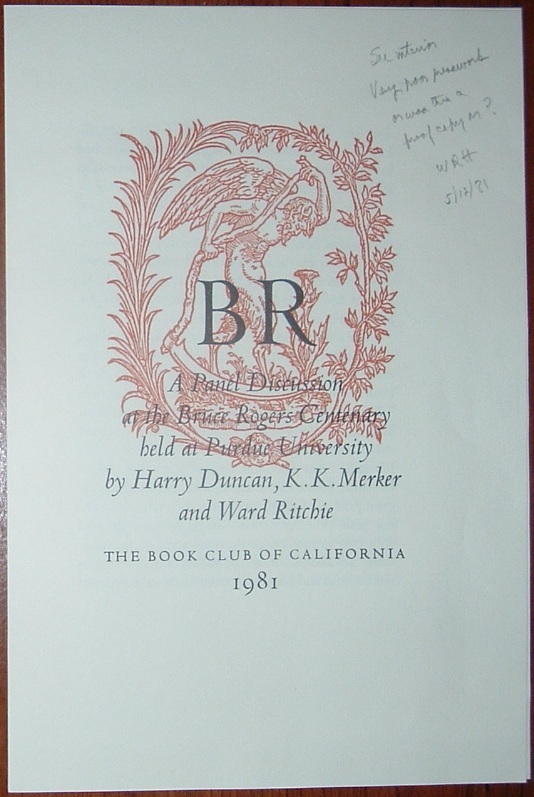 For this post, I've gone back to that folder of ephemera and have selected another prospectus from the Book Club of California: BR: A Panel Discussion of the Bruce Rogers Centenary held at Purdue University by Harry Duncan, K.K. Merker and Ward Ritchie (1981). There's more, but I'm still organizing and studying what I have, as time permits. 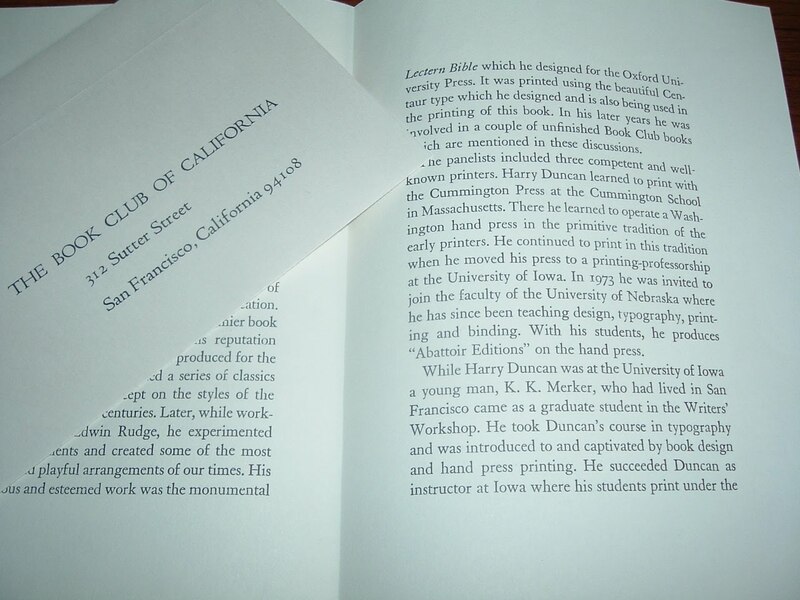 I'm also acquiring similar ephemera directly from the Book Club of California, as I am now a member thanks to Mr. Holman's recommendation and sponsorship. The ephemera from this club have become quite collectible over the years, such as announcements, prospectuses, invitations, and other pieces, which are themselves beautiful examples of design and fine printing. 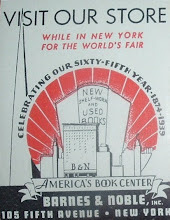 One of the greatest book designers, if not the greatest (which many will contend), of the twentieth century was Bruce Rogers, an Indiana native who lived from 1870 to 1957. He was graduated from Purdue University, where a centennial conference was held in 1970 to commemorate his life and work with typography, printing, and book design. 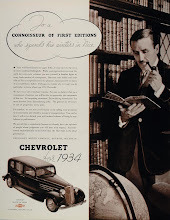 Among his many accomplishments highlighted in the book's prospectus above were his design of the Centaur font, the Lectern Bible he designed for the Oxford Press, and his design work for the Riverside Press. The Purdue conference included a panel discussion between Harry Duncan, K.K. Merker, and Ward Ritchie, all accomplished and recognized printers in their own right. Ward Ritchie actually knew Bruce Rogers, so he was able to contribute personal memories to the discussion. 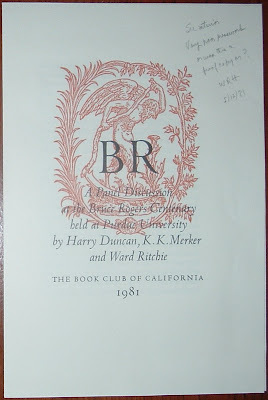 A decade later, the Book Club of California, according to the prospectus for BR, found the transcribed discussion so interesting that they arranged for its publication in book format. The prospectus continues with a brief biography of the panelists and information about the publication of the book. The book was designed by Ward Ritchie and ran over 64 pages with several illustrations of Bruce Rogers' designs. 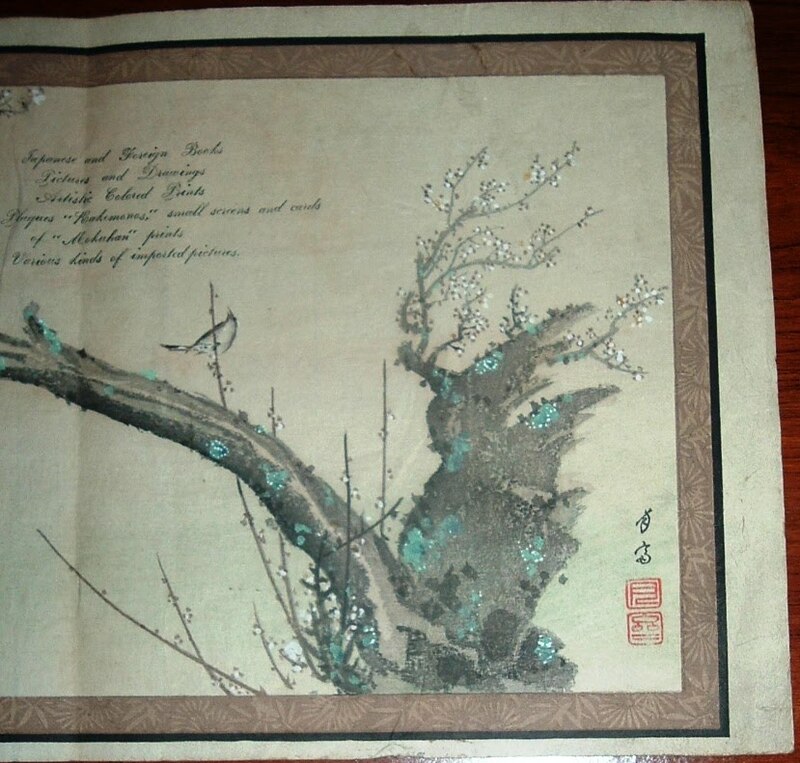 Limited to 600 copies, the book was priced at $20. This Labor Day entry is a stretch for staying within the scope of this blog's content. 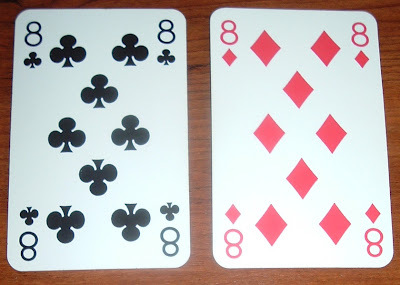 But in honor of the holiday, no labor--let's play cards. 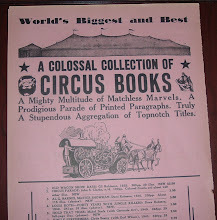 Just when I think I've found all the different kinds of paper collectible relating to books, another one pops up. 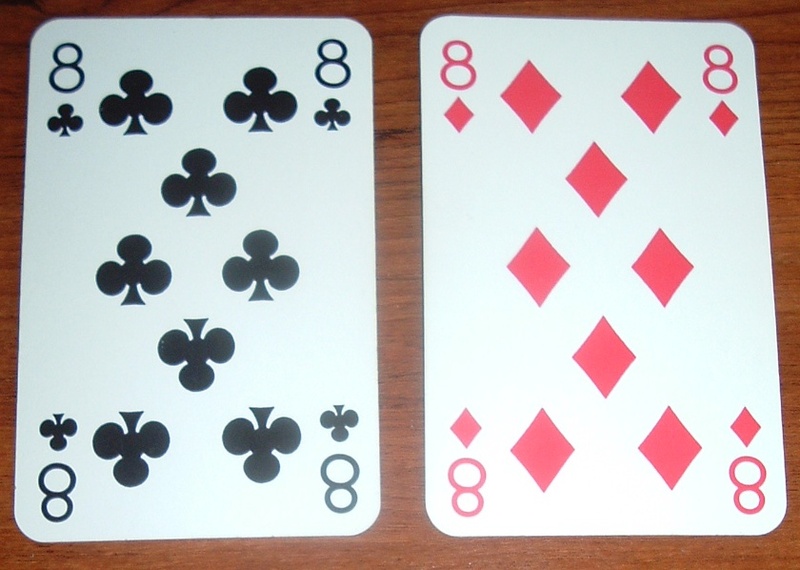 Swap cards. These are single playing cards out of a regular 52-card deck (plus jokers). I didn't know there was a name for this collectible. 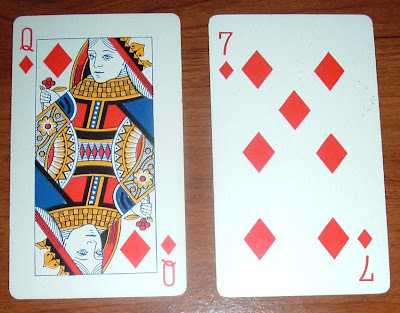 Nor did I didn't know that single cards were all that collectible, except for the truly antique. Although I have picked up a few here and there because of certain subjects portrayed on the card, it only recently dawned on me to look for book-themed cards. I'm late to the game, but deal me in. The swap cards that introduced me to this new world of collectibles are pictured below. 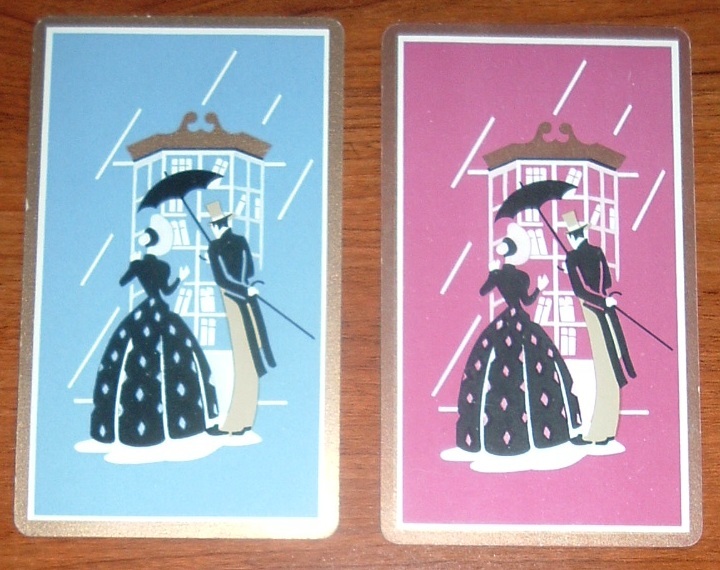 Two cards from what appears to be companion decks, because of the color variation, contain an image of an Antebellum-looking couple browsing books through a shop window. 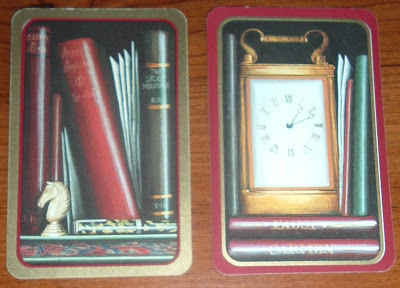 The next set, two cards again, possibly from the same deck, feature old books on bookshelves. There you have it--my inauspicious beginning to the world of swap cards. I'll keep an eye out for more, but I don't think I'll put a lot of labor into it. 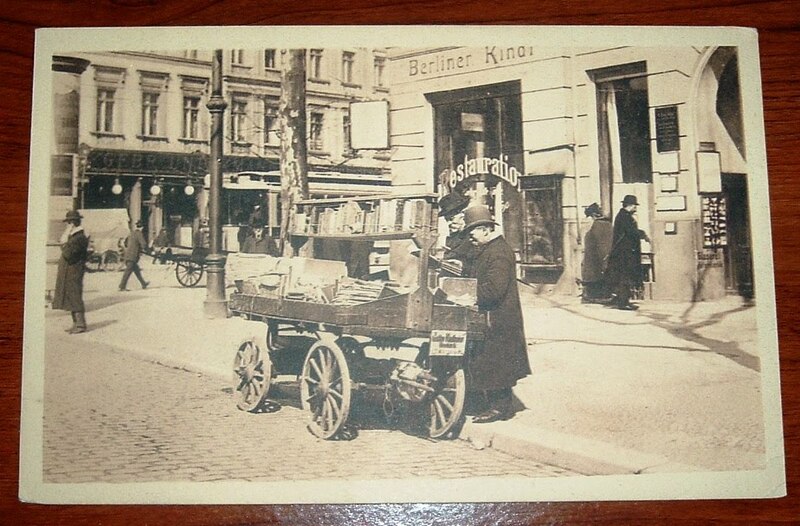 This postcard depicts a German bookseller's wagon, or cart, on a Berlin Street around the turn of the 20th century, likely a bit before 1900. 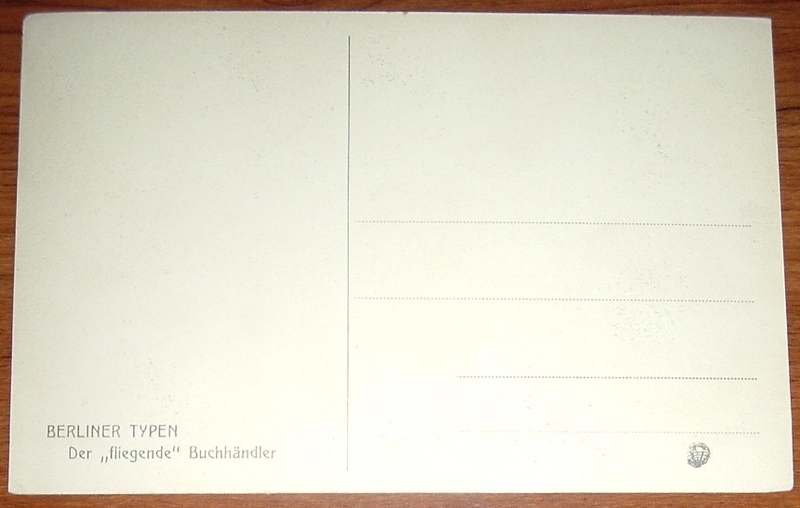 The back of the postcard, which may be a later issue, labels the photo "Der fliegende Buchhändler." I knew Buchhändler was bookseller, but I had to look up fliegende, which translates to flying, i.e., Der fliegende Holländer (The Flying Dutchman), the famous opera by Richard Wagner. By fliegende or flying, it is meant that this bookselling business was portable and mobile. It could move freely about to accommodate buyers in various areas of town or the countryside. 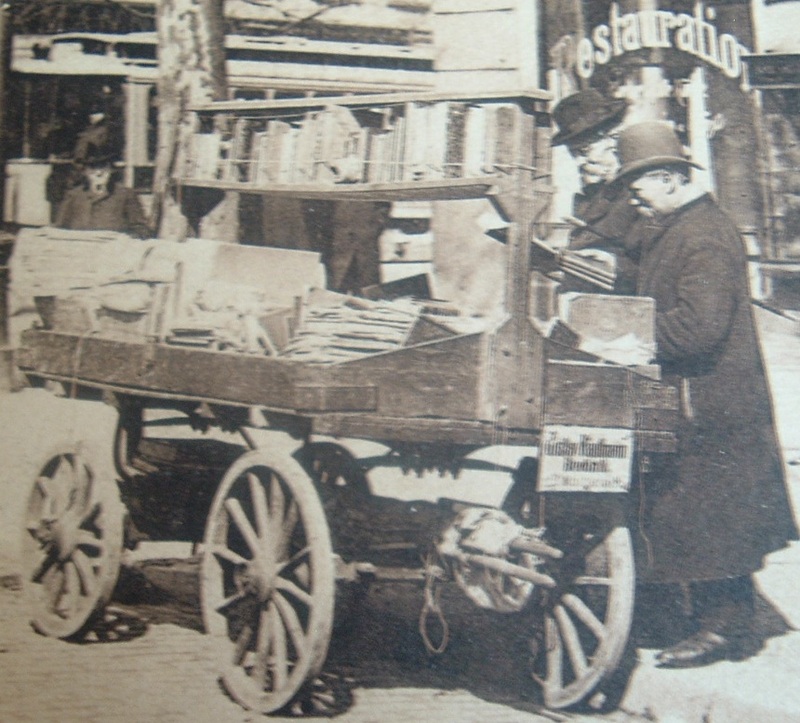 Gustav Kauffmann, according to the sign off the end of the cart, owned and operated this German "Parnassus on Wheels," which appears to have made the rounds in a Berlin business district. 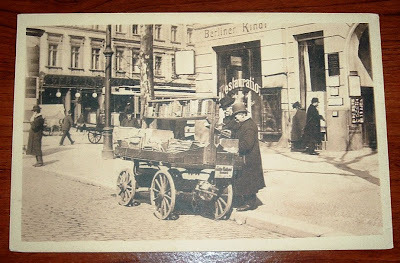 It also looks like Herr Kauffmann is parked outside a restaurant that serves a selection of beer from the Kindle Brewery (advertising above window, visible in the first photo), which is still in business today. 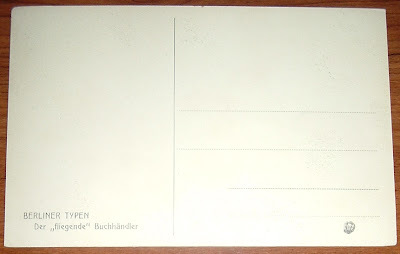 Today, there is another German bookselling business that uses Kauffmann's nickname for their company: Der Fliegende Buchhändler. There's a bit of twist to their business, though. They appear to move "book tables" around their town (Karlsruhe) and region to accommodate sales at events and other settings for various publishers.